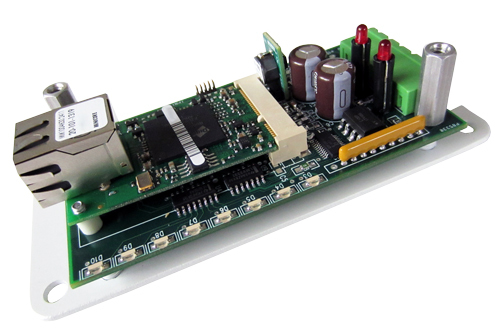 The PMC-1 Pulse-to-Modbus Converter is a device designed to read, record and store pulses from two 2-Wire KY pulse inputs and provide access to the energy use and demand information using the Modbus TCP protocol. Pulse inputs are recorded in the count register and the equivalent energy value is calculated and recorded in the energy use register. The PMC-1’s inputs provide a +13VDC wetting voltage for the meters’ dry-contact outputs. Upon receiving each pulse from the meter, the PMC-1’s microcontroller converts the pulse to the kWh value and adds it to the energy use register. The instantaneous, average and peak demand (kW) are also captured and available in three separate registers for each channel. Average and Peak Demands are based on a 15 minute demand interval. Energy use information collected and stored in non-volatile memory and accessible by using the RJ-45 Ethernet connection of the PMC-1. The Modbus protocol allows accessing the specific PMC-1 device using a unique IP address, and the register for the information of the pulse channel desired. A RS-232C DB9 serial port allows quick programming of the IP address and pulse value. A master reset capability allows all registers to be cleared. The PMC-1’s bright red LED lamps indicate the Pulse input’s status at all times. Eight additional green LED’s indicate device and network status. Pulse Input: Two KY Form A (2-wire) inputs with +13VDC wetting voltage compatible with dry contact or open-collector transistor output. Detachable terminal block. Input Voltages: 12VAC. Contact Factory.